The Western Australian Museum was putting on an exhibition on the history of cricket in Western Australia. 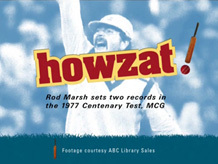 The exhibition goes through the from early days to the present, focuses on some of the great players from Western Australia as well as number of interactive elements within the exhibition. I was responsible for most of the audio/visual elements of the exhibition, these included video editing, creating a video treatment for the magic moments as well as other footage, audio editing and production for the audio listening post and 1930's radio and installing the video component for viewers lounge and LCD screens around the exhibition. Update 2007: My involvement with this exhibition continued in August of 2007 where I had re-edit the Television commercial for the Kalgoorlie-Boulder and Albany versions of the exhibition. That included creating new video graphics, changing the dates and adding new logos.